Posted in UncategorizedLeave a Comment on Funderland Park Guest Appreciation! Are you looking for as awesome, exciting job? Do you love working with kids and outdoors? A Funderland Ride Operator might be the job for you! We are looking for outgoing, upbeat individuals to make our guests experience top-notch! As a team member, you’ll be welcoming parents and children to the park, helping children get on and off the rides safely, maintaining safety in lines and around the ride area, and encouraging a memorable, relaxed, and carefree day at the park for all guests! In our search for exceptional new team members, Funderland will be hosting Open Interviews every Thursday in March from 2pm-4pm! If you meet the requirements in our Job Posting, we want to meet you! Please print out an application form, fill it out, and stop by the park at the designated time! You can check in at the ticket booth, and we will be with you shortly to begin the interview. Did you make a New Year’s resolution this year? Most people did, and in case you were curious, these are the Top 10 Most Common Resolutions, according to the latest survey, featured on inc.com and goskills.com. Although we can’t help you shed those extra pounds or sort the shelves in your living room, we can definitely help with numbers 5 and 8! It’s no surprise to us that many people are prioritizing “living life to the fullest” and “spending more time with family and friends.” Those truly are the most important things in life and we, at Funderland Park, are fortunate enough to experience our park guests enjoying time with their friends and family every day we open our gates! If you want to get serious about setting and following a truly necessary resolution, why not consider getting a Funderland Season Pass? What better way to make sure you are blocking out time regularly to spend time with your family than to already have your pass purchased and ready for use! Having a year pass eliminates excuses for not going, and can actually help you save money (#3!) throughout the year, because you can spend time doing something that’s already paid for! Can you believe that if you come to Funderland Park just once a week this 2019 season using a Season Pass it would only cost $1.74 per visit for ALL DAY riding?! That sounds like some money saving to us! Kids grow up SO fast, and we want to provide an opportunity for you to spend as many good times as possible with them! This year for our 12 Days of Christmas Giveaway, we will be selecting one winner per day to take home a 2019 Season Pass! The giveaway will begin on December 12th, and the last entries will be received on December 23rd by midnight. The final Grand Prize winner will be selected and announced on Christmas Eve! Each Day will have a new post and a new winner announced, so make sure you are always commenting on the most recent post! If you do not have a facebook page, you can email us at [email protected] to enter. Let’s take a moment to bring it back to the basics. Here are a few simple activities to get you and your kids really thinking about what you are thankful for, and spending some quality time together. Get your kids really thinking about all the things in their life they appreciate. From the things they love to the things that challenge them and make them better, from the things they see and interact with everyday to things that are brand new to their ever evolving young lives. Schedule in some time to get out of the house and make some memories with your family! Kids crave your attention, and live for quality time with the ones they love. 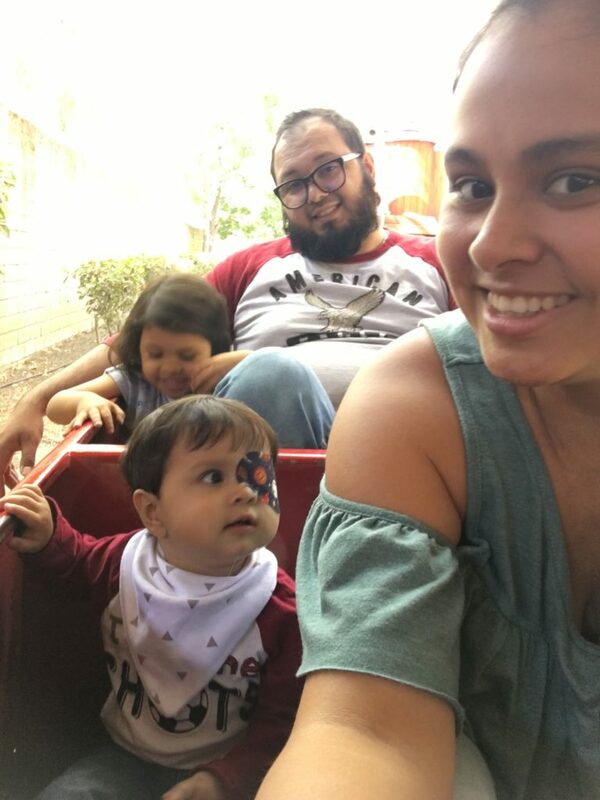 It can also be a lot of fun to show any out-of-town family around an age old Sacramento gem.. like Funderland! Funderland Park is open Thanksgiving weekend (Friday 11am-5pm, Sat & Sun 10am-5pm). If you want to extend the fun, we’re offering a discount on 2019 Season Passes right now for $20 off the normal price! You can check out details here. Don’t forget to take those cherished candid photos! There are probably a handful of adults that your kids spend a lot of time with, but don’t really know a lot about their lives outside of day to day interactions. As your kids grow, they will be ever thankful for the advice of mentors they’ve had to guide them through some of the toughest years. A light hearted interview can not only open up doors to more meaningful relationships, but can also be a lot of fun for your child to pretend to be a journalist on their own story! -Who was your best friend when you were my age? What did you play? -Describe the house and town where you grew up? -What was your favorite toy? -What was your favorite game? -What are some funny things my mom or dad did when they were a kid? As always, we wish you and your family a Happy Thanksgiving from your friends at Funderland Park! It’s that time of year to get into some fall fun! Between the pumpkin spice everything, Instagramming fall leaves, and picking the perfect pumpkin, sometimes it can be easy to lose sight of the more important things, like spending time with your family. There are few things more fun to a kid than making crafts with their favorite people (that’s you!). Here are some fun craft ideas to try with your little ones this season! P.S. If you’re looking for some FREE crafts to enjoy with the kids, we will have a craft booth at our Fall Festival on the 27th and 28th! 1. Cut your fabric into a square, about 9”x9”. You can cut them using regular fabric scissors, but realize the ends will fray eventually depending on the fabric. You can cut the fabric squares out using pinking shears to prevent fraying. (Plus, the zig zag edge gives the ghosts a unique look). 4. Flip the fabric over. 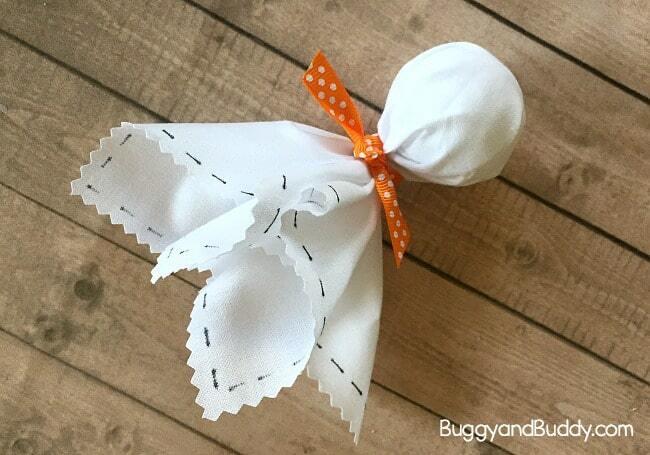 Place a styrofoam ball in the center of the fabric, and gather it around the ball to form the head of your ghost. 6. Draw eyes on your ghost with a black marker. 7. 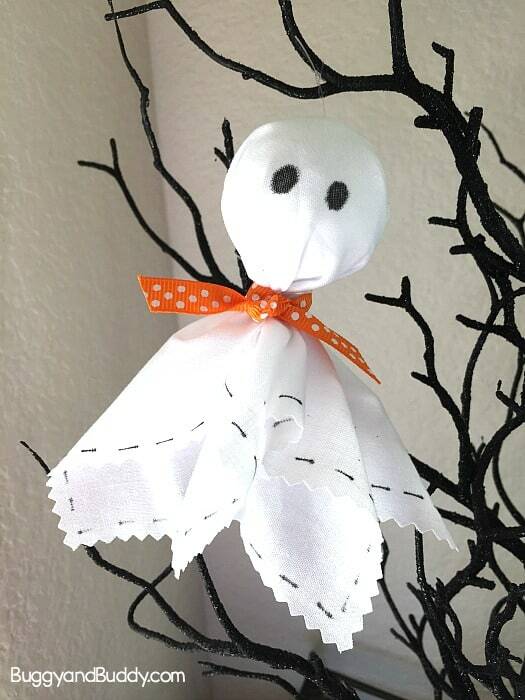 Tie some clear string (illusion cord) around your ghost to hang from a decorative branch or anywhere around your house or classroom! 3. Slide assortment of buttons onto the pipe cleaner branches for leaves. That’s it! You could add numbers to the trees and children try to put that many buttons on that tree. They could try to get every single button in the bin onto a tree branch. Older children could practice skip counting by putting two buttons on each branch, or three buttons on each branch. 1: Roll the clay out, about 1/2″ thick. Let your little one press her hand onto the clay. 2: Use a craft stick to cut the shape of a pumpkin. Smooth the edges. Make a hole in the stem with a drinking straw. Step 3: Let the clay dry for 24 hours. 4: Use acrylic paint to turn the handprint into a Halloween design. It can be a ghost, Jack’o’Lantern, Frankenstein, candy corn. Paint the rest of the pumpkin orange and the stem brown. 5: Thread a green ribbon through the hole in the stem. Posted in UncategorizedLeave a Comment on Do you remember your first time at Funderland Park? Why hosting your kids birthday at Funderland is an AWESOME idea. 1. Birthday Party Host/Hostess available at the beginning of your party to help set up, answer questions, and administer hand stamps. Wait what? I don’t have to do everything?! That’s right! When you book a birthday party at Funderland you will have a host that is included in your birthday package to help you with anything you may need to get your party started. 2. Birthday party invitations – print your own invitations from our website. Don’t worry about making an extra stop to get birthday cards, we have pre-made invitations one click away! 3. Take advantage of our birthday party area for a full hour & unlimited rides for 2 hours. It gets better… enjoy two hours of unlimited rides for each paid rider! 4. Ticket book with a value of $19.95. Included in your package is a book of ten rides for a value of $19.95! 5. Free ticket back to park for birthday child. Your child will be able to come back and enjoy an additional day for free! So what are you waiting for?! Go book your child’s next birthday party at Funderland! Posted in UncategorizedLeave a Comment on Why hosting your kids birthday at Funderland is an AWESOME idea. Posted in UncategorizedLeave a Comment on Kid + Adult Adventure Giveaway!